Celebrity Crisis: a short attention span essay about famous people. A few weeks ago, on Friday May 8th, Housing Works hosted a show featuring The Dirty Projectors enhanced by Bjork. In true internet vulture style, it was rapidly documented by its sponsors, analyzed by the paper of record, and parsed for tidbits of celebrity gossip. S’all good! — I just wish all the looky-loos put equal time into considering the songs: The Girls precision & lightness; Mr. David Longstreth’s persistence of vision, his eternal return & ever-tightening focus on certain musical ideas & lyrical notions (i.e. brown finches! ); Bjork’s inspiring power & her voice which seems less like human singing than a natural force. After the jump I’ll post the second song from a different point of view. So, yeah, no need for me to go deep on the music. 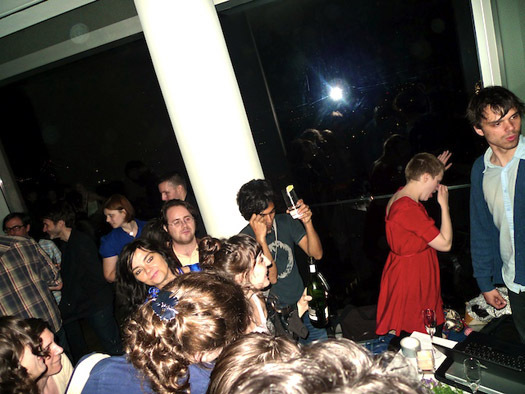 The event and its insane afterparty has, however, aroused some thoughts about celebrity. In part that’s because it abutted two other fame-dense events I’ve attended in recent weeks — first, the Dark Was the Night benefit concert at Radio City (which my partners in Brassland so ably curated) and, second, a star-dusted appearance by Vampire Weekend at the Happy Ending Reading & Music Series at Joe’s Pub. (I am helping the series’s founder Amanda Stern here and there as an informal music advisor, gurudom being my latest career aspiration. But no, I had nothing to do with this booking.) As well, an unusual number of internet postings on the subject of fame have stuck in my mind of late. How could I forget this Craiglist ad offering “Many Items from Old R. Kelly House – $1 (Northside Chicago), and this recent edition of Bob Lefsetz’s crotchety internet newsletter about his dinner with Malcolm Gladwell. Fame fame fame lingers in my membrane like a persistent Apple Macintosh rainbow wheel of death. Yup, yup, that’s how we do! It’s not like I’d ever deny the internet and our culture at large are awash in celebrity, but I’m usually able to avoid it. From my perspective, our celeb-fascination generally focuses on American Idol contestant this, Justin Timberlake that; Oprah this, and reality-tv-star-I’ve-never-heard-of-before that. I’m barely aware of such things because I spend most of my life so deep in a niche — television as much a blip on my horizon as classical composition is to most normal people. I’d more likely recognize Elliot Carter at a crowded bar than I would a cast member of Laguna Beach: The Real Orange County. 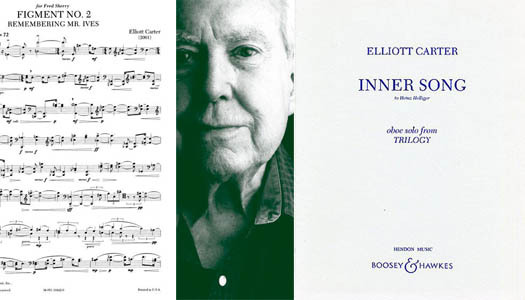 And, here’s the thing, I don’t even know or like Elliot Carter’s music. It’s just that he is a larger personage in the world I’ve chosen to construct for myself. Anyhoo, it feels as if my universe is gentrifying, both literally (Boerum Hill is a much fancier place than when I first moved here) and metaphorically. Many of the artists I work with are now well-known enough that mentioning them in casual conversation causes even non-music fans to pause and say things like “Oh yeah, they are totally a buzz band?” — voices rising on that last syllable like the awed sound of yr average American teenager. I wish I could say this was amazing or useful or even whatevs. Instead, it is mostly…awkward. Do I sound like a douche because I’m mentioning the name of a friend and the fact that they are making the kind of art I think makes life worth living? Or is it more douchey to play coy & alluring and only talk about the weather? Now, let me make something clear. Other than the folks I’ve been working with for years, I don’t generally try to talk to the ambient Famous People, mostly because it’s hard to do so. There’s nothing casual about their presence. I recall the scene after a Nick Cave concert in Los Angeles many years ago. (This Nick Cave, not that one.) I was with some new friends from the indie rock sector of the music economy. Many of us were meeting one another for the first time but, as we introduced ourselves around the circle, I couldn’t help but feel a strange twinge of “C’mon now?! ?” when the preliminary hellos got to the one-of-those-people-that’s-not-like-the-others, i.e. Christina Ricci. Yes, we’d all seen Beetlejuice. It felt a bit like being introduced to your own mom, simply unnecessary. That was, perhaps, the first time I was struck by celebrity’s real & unfortunate gravitational force. A few more thoughts about this from someone other than me after the jump.